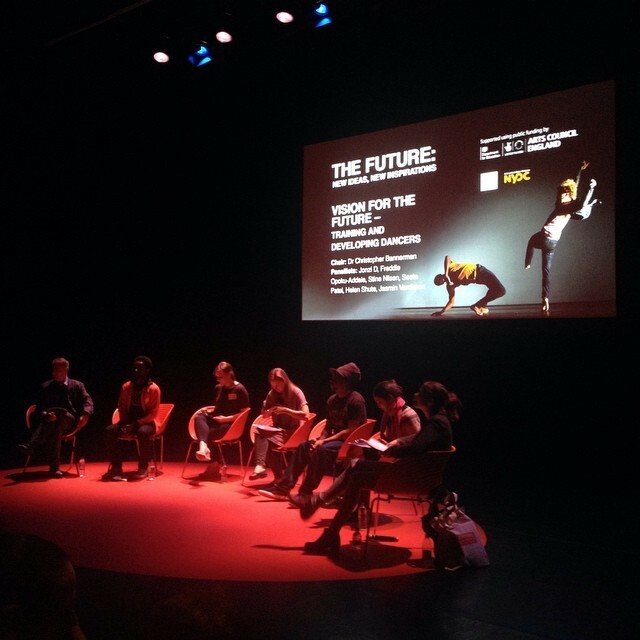 Dance UK’s conference went really well. The sad thing about working on an event is that you never fully get the opportunity to experience it like a visitor. I was so focused on my work that I didn’t have the time to really attend the sessions, some of which would have been really interesting to a cultural policy wonk like me. I may never get over squeeing a little bit internally every time I see some of my work being used. In this case, title slides for all of the presentations, projected all over the place. A big highlight during the conference for me was a performance by Verve, the postgraduate performance company of Northern School of Contemporary Dance, performing Ocean, choreographed by Jamaal Burkmar. Such an inspiring and moving piece of work. You can see footage of the whole performance here. Right on the heels of Dance UK’s conference, I headed to the Nehru Centre to watch one of our interns, Gayathri Rajaji, perform a recital in tribute to her late guru Adyar K Lakshman. I was interested in going because bharatanatyam is a dance form I know absolutely nothing about. I think it was a beautiful tribute and introduction to the style. I was really impressed by how complex the rhythms were and how much hand-finger-foot-eye coordination was involved. But what I enjoyed most about the performance was that she took the time to explain the stories that the dances told, making gestures with her hands as she narrated. It meant that while you were watching the dance you could follow along with the story just by watching her hands. Without that explanation the dance would have still been beautiful and interesting, but my comprehension would have stopped at a purely aesthetic level. As soon as the gestures were explained, the language barrier was broken and the dance communicated so much more, and didn’t feel foreign at all. The key was having that language translated. I think sometimes I forget that dance is an abstraction of lived experience. This is something that both Jonzi D and Ivan Blackstock expressed in their own ways during the conference, in speaking about hip hop. Take, for example, Jonzi D’s tree. Hip hop’s not my thing. I didn’t see a tree until he explained that this was a tree, and once he did, I saw it. It was there. I think it’s true of any style. Once you move past the abstraction and conventions you find that underneath the dance is communicating something far more universal.